At its simplest or crudest the poetry describes a pastoral idyll and an innocent people spoiled by the dread hand of foreign-brought war and Western technology (the mobile phone, for instance, suffers harsh criticism). Some of it is propagandistic, most isn’t – in truth it’s hard to draw a line, as poetry inevitably reflects its authors’ perceptions. The emotions are true in the poets’ hearts, and in those of their original audiences, even if they appear strange to Western minds. 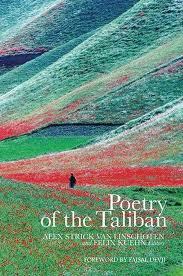 But a great deal of this Taliban poetry will be comprehensible to Western readers who are unable to understand Taliban ideology. The major themes are recognisable, even universal, and the dominant form is the ghazal, or love lyric, which links the Pushto language to the classical civilisations of Persia and India and to the mystical tradition of ambiguous imagery in which wine and the face of a beautiful woman may or may not symbolise divine ecstasy and God. The poems describe a land of mountains and pines, each stone a ruby, each bush a medicine, and of laughing blossoms, dancing tomorrows, of twilight arriving with its lap full of red flowers (the poem called “Sunset” reads more like a product of a Zen monastery than of a Deobandi madrasa). What is so interesting is that the Taliban’s official face and past practice has been so fiercely anti-Sufi, anti-historical, and seemingly anti-culture. This book provides an entirely different outlook. Indeed, in their rich memory of 19th Century British invasions, of Afghan folklore and Islamic heroism, the Taliban poets seem more awake to history than we are. The book’s complex interplay of modernity and tradition, puritanism and sensuality, parochialism and globalism, is fascinating; and many of the poems are fascinating in their own right, as works of art.